The Greater Prairie-Chicken was formerly a common resident throughout the northern Great Plains, and its range extended east as far as Ohio, Kentucky, and Tennessee. The species has been extirpated from several states in the eastern portion of its range, but small remnant populations still occur in other states where appropriate grassland habitat is available. Today, the primary range of the Greater Prairie-Chicken is confined to portions of the prairie states of Kansas, Nebraska, and South Dakota. In presettlement times, the Greater Prairie-Chicken probably only occurred in extreme southern Minnesota, although the extent of its range in the southeastern region of the state is unknown (Partch 1973; Svedarsky et al. 1997). The species then followed the northward spread of agriculture and logging, and by 1880 was found statewide with the exception of northeastern and extreme north-central Minnesota. However, the subsequent conversion of prairies to row crops and forest succession in the early 20th century reduced the species' range and numbers. Approximately 328,914 Greater Prairie-Chickens were harvested in 1923 compared to 58,000 in 1942, when the hunting season was closed (Svedarsky et al. 1997). The Greater Prairie-Chicken was designated as a species of special concern in 1984, at which point most birds were restricted to a strip of grasslands in northwestern Minnesota, primarily in the beach ridge complex of Glacial Lake Agassiz. A small remnant flock of Greater Prairie-Chickens also occurs in north-central Minnesota, primarily in Wadena and Cass counties, but fewer than 10 males were reported from this flock in the spring of 2005 and 2006 (M. Larson, Minnesota DNR, pers. comm.). Unless there is a major wildfire in this area, this remnant flock may disappear in the next few years (D. Trauba, Minnesota DNR, pers. comm). The Greater Prairie-Chicken is a brown, chicken-sized bird with a heavily barred feather pattern. Its tail is relatively short, dark, and rounded in appearance. The species is well known for the male's conspicuous courtship display on its breeding grounds. As the male booms (dances), dark, elongated feathers become erect behind his head, and a bare orange patch above the eyes engorges. Yellow-orange air sacs on the sides of the males' neck also inflate, amplifying their characteristic booming sound. The Greater Prairie-Chicken's preferred habitat changes with the seasons. During the spring breeding season, several different habitats are utilized. Open expanses of short cover are used for courtship activity, while dense, undisturbed cover, approximately 30-38 cm (12-15 in.) high is used for nesting. Cropland and burned habitats are used for feeding and loafing. During the summer, the Greater Prairie-Chicken favors open habitats, including native prairie and grasslands that have been disturbed by burning, grazing, or haying. In fall and winter, croplands, grass and forb habitats, and disturbed areas that provide winter food are most important. Low areas with dense vegetation are preferred for roosting cover year-round, and snow is used for burrowing when available. The Greater Prairie-Chicken may be a year-round resident or may migrate short distances between breeding and wintering grounds (12-170 km; 7.5-106 mi.). Females are more likely to migrate than males. Greater Prairie-Chickens are highly social in all seasons, with mixed flocks in winter and segregated flocks during breeding. They show high fidelity to breeding, nesting, and wintering sites (Schroeder and Robb 1993). In spring, males form groups in open courtship areas known as leks or booming grounds. Each male maintains a small territory on the lek, and returns to the same lek each year. During courtship, males leap, flap, drum their feet, strut, and make a low-frequency booming vocalization to attract females. A female displays to a potential mate by dropping her wings and squatting. Mating occurs on the lek, after which hens leave to nest. A hen builds her nest in thick vegetation, creating a depression in the substrate and lining it with dried vegetation and feathers. The female incubates, broods, and rears the young without assistance from the male (Schroeder and Robb 1993). Females lay an average clutch of 12 eggs starting about 4 days after mating. The eggs are smooth, slightly glossy, olive-buff or gray-olive in color, and finely speckled. Incubation lasts about 25 days. Emerging chicks are precocial, and leave the nest to feed with the hen soon after hatching. Chicks are able to fly well at 3 weeks old. Broods disperse after 80-84 days, but young may still flock together (Schroeder and Robb 1993). Females only raise 1 brood per season. Hatching success is very high (73-93%), but nest success is lower (22-65%). Mortality rates also increase after hatching. Studies have found highest success for nests within dense vegetation and in areas of low predator density. Nesting success was also correlated with greater distance from leks, and lower density of prairie-chicken nests (Schroeder and Robb 1993). The Greater Prairie-Chicken feeds on plant and insect material. Cultivated grains, leaves, and seeds are most important in winter. Leaves, seeds, fruit, and insects are taken during the breeding season. Greater Prairie-Chickens generally forage on the ground, and mainly during morning and evening hours (Schroeder and Robb 1993). Predators include red-tailed hawks (Buteo jamaicensis) and great horned owls (Bubo virginianus). 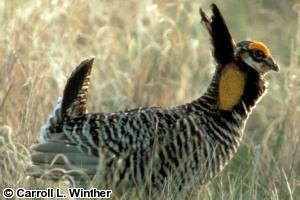 Lack of appropriate habitat is the greatest threat to Greater Prairie-Chicken populations. Large, nearly treeless landscapes are needed and in Minnesota, the greater prairie-chicken uses a mixture of native prairie, non-native grasslands, and disturbed habitats. Where these occur in the right proportions and configuration, populations are stable and, in recent years, even expanding. In many areas, however, grassland acreage continues to be converted to cropland or to forest land through either planting or natural succession. As grassland acreage is reduced, so are greater prairie-chicken numbers. Rotational burning, haying, and possibly grazing can help maintain the vigor and openness of grassland habitats within the species' range. It is important to secure grassland tracts by acquisition, easements, or other incentive programs in areas with greater prairie-chicken populations. Native prairie tracts are of primary importance, although tame grasslands of brome (Bromus spp.) or other grass species are used as well. Conservation Reserve Program (CRP) grasslands have been vitally important in providing habitat connectivity for Greater Prairie-Chickens in Minnesota and other Midwestern states, and they should continue to be managed and maintained (Rosenquist 1996; Rogers 2005; Rogers and Hoffman 2005). Of great concern is the potential for hundreds of thousands of acres currently enrolled in the CRP to expire and be converted back to row crop production by 2012. Wind farm development on beach ridges also has the potential to negatively impact greater prairie-chickens through habitat avoidance and fragmentation. Grassland birds typically avoid vertical structures, such as wind towers, which are perceived as perching spots for raptors and other predators. With already limited availability of large, open grasslands, further habitat fragmentation could lead to population declines. Thus, it is important that wind farms be carefully designed to minimize impacts on Greater Prairie-Chicken habitat. Ring-necked pheasants (Phasianus colchicus), a species not native to North America, are known nest parasites of the Greater Prairie-Chicken and they disrupt booming grounds and feeding areas. To ensure the prairie-chicken's survival in North America, further research on pheasant/prairie-chicken interactions is recommended (Toepfer 2003). The Minnesota Prairie Chicken Society conducted annual Greater Prairie-Chicken counts from 1974-2003 (Larson 2005). In the spring of 1982, members counted 1,648 males on 146 booming grounds in 14 counties, compared with 841 birds on 74 booming grounds in 11 counties in 1978 (Natural Heritage Information System 2008). Some of this increase was probably a result of greater survey effort. In 2001, 1,309 males were counted on 136 booming grounds. However, 61% of these booming grounds contained 10 or fewer males. In 1999 the Minnesota DNR began relocating Greater Prairie-Chickens into portions of west-central Minnesota, south to the upper Minnesota River valley. Most of this work centered around the Lac qui Parle Wildlife Management Area and central Big Stone County. Between 1999-2006, 574 greater prairie-chickens were trapped and transplanted from northwestern Minnesota to 15 different sites throughout west-central Minnesota. In 2006, 11 booming grounds with 100 males were located within the reintroduction area. Overall project success will not be known until 2010, when the population will be totally supported by natural reproduction. Based on survey results in the species' primary range (excluding the reintroduction areas), the DNR Division of Fish and Wildlife (DFW) determined that Greater Prairie-Chicken populations in northwestern Minnesota could again sustain a modest harvest. A limited-entry hunting season was initiated in 2003 and has continued to expand. The offering of a hunting season has helped to develop a constituency for greater prairie-chicken habitat protection and restoration. The DFW also began coordinating the annual population surveys in 2004 and adopted a standardized survey design. Prairie-chicken abundance is recorded in widely distributed survey blocks in northwestern Minnesota as a means of monitoring population trends. In 2005, a minimum of 2,958 male Greater Prairie-Chickens were estimated to be present in western Minnesota on 243 booming grounds (Larson 2005). In 2007, 3,294 males and 263 booming grounds were recorded (Larson 2007). It is important to continue counting Greater Prairie-Chickens on spring booming grounds to evaluate population trends and the effectiveness of management practices. Land management activities that provide adequate booming, nesting, foraging, roosting, and wintering grounds are also essential. Several public and private partners including the Minnesota DNR, U.S. Fish and Wildlife Service, The Nature Conservancy, and the Minnesota Prairie Chicken Society have undertaken considerable efforts to preserve and restore grassland habitat for Greater Prairie-Chickens in Minnesota, and it is expected that this work will continue. Opportunities to observe the Greater Prairie-chicken’s spring courtship display are available at several locations in Minnesota and North Dakota. Viewing structures (called “blinds”) may be reserved for use during the late-April/early-May display season. Larson, M. 2005. Spring 2005 Prairie-Chicken survey in Minnesota. Minnesota Department of Natural Resources, Grand Rapids, Minnesota. 5 pp. Larson, M. 2007. Grouse surveys in Minnesota during spring 2007. Minnesota Department of Natural Resources, Grand Rapids, Minnesota. 18 pp. Natural Heritage Information System, Division of Ecological Resources, Minnesota Department of Natural Resources. November 6, 2008. Prairie Chicken Historical Database. St. Paul, Minnesota. Partch, M. C. 1973. A history of Minnesota's Prairie Chickens. Pages 15-29 in W. D. Svedarsky and T. J. Wolfe, editors. The Prairie Chicken in Minnesota. University of Minnesota, Crookston, Minnesota. Rodgers, R. D. 2005. Conservation Reserve Program successes, failures, and management needs for open-land birds. Pages 129-134 in A. W. Allen and M. W. Vandever, editors. The Conservation Reserve Program - planting for the future: proceedings of a national conference. United States Geological Survey, Biological Resources Division, Scientific Investigation Report 2005-5145. 248 pp. Rodgers, R. D., and R. W. Hoffman. 2005. Prairie Grouse population response to Conservation Reserve Program grasslands: an overview. Pages 120-128 in A. W. Allen and M. W. Vandever, editors. The Conservation Reserve Program - planting for the future: proceedings of a national conference. United States Geological Survey, Biological Resources Division, Scientific Investigation Report 2005-5145. 248 pp. Rosenquist, E. L. 1996. Winter aspects of Prairie Chicken ecology in northwest Minnesota. Thesis, St. Cloud State University, St. Cloud, Minnesota. 72 pp. Schroeder, M. A., and L. A. Robb. 1993. Greater Prairie-Chicken (Tympanuchus cupido). Number 36 in A. Poole and F. Gill, editors. The birds of North America. The Birds of North America, Inc., Philadelphia, Pennsylvania. Svedarsky, W. D., T. J. Wolfe, and J. E. Toepfer. 1997. The Greater Prairie-Chicken in Minnesota. Minnesota Wildlife Report 11. Minnesota Department of Natural Resources, St. Paul, Minnesota. 19 pp. Toepfer, J. E. 1994. Reintroduction of Greater Prairie-Chickens into the Kelly's Slough, North Dakota, 1992-1994. Progress Report submitted to North Dakota Game and Fish and the Minnesota Department of Natural Resources. 29 pp. Toepfer, J. E. 2003. Prairie Chickens and grasslands: 2000 and beyond. A report to the council of chiefs. Society of Tympanuchus Cupido Pinnatus, Ltd. Elm Grove, Wisconsin. 69 pp.